Departing at either 7am or 1pm our fabulous local crew will keep you entertained until the fish strike! 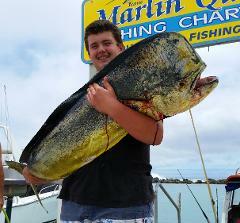 We provide everything you need including food, water and all the fishing gear - ready to catch the big ones! You only need to bring a hat, sunscreen, camera/gro pro, sturdy foot-ware and a light jacket or pull-over. All fishing gear/tackle/baits are supplied and we also provide a light breakfast/lunch which includes freshly made sandwiches, cake/muffins, fruit and bottled water. If you have a special dietary request just let us know - Gluten Free and other options are available. We have a share catch policy, at the end of the trip our crew will fillet the catch and share it amongst the group to eat while your on the island. Don't have cooking facilities at your hotel?? No problem, we have some great restaurants on the island who will cook your catch for you. Reporting time is 10 minutes prior to departure at the Western Marina, Avatiu Harbour, Avarua (main town of Rarotonga) or we offer a one way fare pickup/drop-off service at $10.00pp from anywhere on the island, just include this option when selecting your charter. You are able to pay by either by cash or credit card at the harbor and note that there is a 4% credit surcharge on all credit transactions. Rarotongas best known and most trusted fishing charter we operate 7 days per week and provide a professional, safe, informative and fun fishing experience. 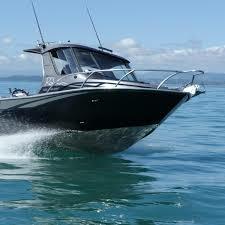 Our experienced local crew have over 60 years combined fishing experience! Departing at 6am (we can be flexible to suit your individual or group needs) our fabulous local crew will keep you entertained until the fish strike! You only need to bring a hat, sunscreen, camera/gro pro, sturdy foot-ware and a light jacket or pull-over. All fishing gear/tackle/baits are supplied and we also provide a light breakfast/lunch which includes freshly made sandwiches, cake/muffins, fruit and bottled water. If you have a special dietary request just let us know - Gluten Free and options are available. Reporting time is 10 minutes prior to departure at the Western Marina, Avatiu Harbour, Avarua (main town of Rarotonga) or we offer a one way fare pickup/drop-off service @ $10.00pp from anywhere on the island, just include this option when selecting your charter. Departing at either 7am or 1pm our fabulous local crew will keep you entertained until the fish strike! You only need to bring a hat, sunscreen, camera/gro pro, sturdy foot-ware and a light jacket or pull-over. All fishing gear/tackle/baits are supplied and we also provide a light breakfast/lunch which includes freshly made sandwiches, fruits and bottled water. If you have a special dietary request just let us know - Gluten Free and options are available. Departing at either 7am or 1pm our fabulous Captain will keep you entertained until the fish strike! You only need to bring a hat, sunscreen, camera/gro pro, sturdy foot-ware and a light jacket or pull-over. All fishing gear/tackle/baits are supplied and we also provide a light breakfast/lunch which includes freshly made sandwiches,fruits and bottled water. If you have a special dietary request just let us know - Gluten Free and options are available. Departing at 7am (or at a time to suit your group) our fabulous captain will keep you entertained until the fish strike! If you choose to book now you pay only 25% deposit & the balance is payable on the day of the charter. All fishing gear/tackle/baits are supplied and we also provide a light breakfast/lunch which includes freshly made sandwiches,fruits, bottled water. If you have a special dietary request just let us know - Gluten Free and options are available. We have a share catch policy, at the end of the trip our crew will fillet the catch and share it among the group to eat while your on the island. Don't have cooking facilities at your hotel?? No problem, we have some great restaurants on the island who will cook your catch for you. Reporting time is 10 minutes prior to departure at the Western Marina, Avatiu Harbour, Avarua (main town of Rarotonga) or we offer a pickup/drop-off @ $10.00pp one way fare service from anywhere on the island, just include this option when selecting your charter. You are able to pay by either by cash or credit card at the harbor and note that there is a 4% credit surcharge on all credit transactions. Departing at 7am (or at a time to suit your group) our fabulous captain will keep you entertained until the fish strike! If you choose to book now you pay only 25% deposit &amp;amp;amp; the balance is payable on the day of the charter. 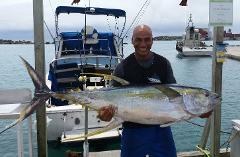 Departing at 7am or 1pm our fabulous captain will keep you entertained until the fish strike! If you choose to book now you pay only 25% deposit & the balance is payable on the day of the charter. Reporting time is 10 minutes prior to departure at the Western Marina, Avatiu Harbour, Avarua (main town of Rarotonga) or we offer a pickup/dropoff service from anywhere on the island, just include this option when selecting your charter.